Lifestyle writer who is passionate about all things health, nutrition and food. 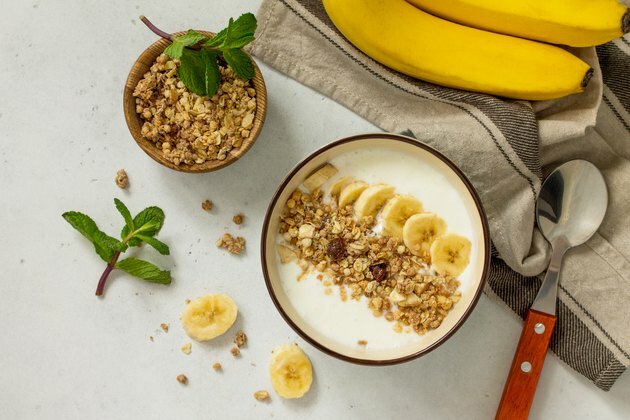 When it comes to maintaining healthy eating habits, Glenys Oyston, RDN stresses the importance of starting your day with a balanced breakfast. "Without that first meal of the day, your metabolism stays sluggish and slow because it doesn't know if there will be enough energy coming in to fuel the day's activities," she says. And while peanut butter may not necessarily come to mind as a breakfast food, we have good reasons for you to rethink the childhood favorite lunch spread and recast it as a morning power player. Peanut butter is high in fiber, a good source of plant-based protein and is also rich in heart-healthy fats. And according to Oyston, "There is a lot of emerging science around the benefits of nuts in a diet, such as blood sugar regulation, and they are a great source of magnesium and potassium. The best reason to eat peanut butter is, of course, because it tastes good — and with the protein and fat combo, it's also really satisfying." 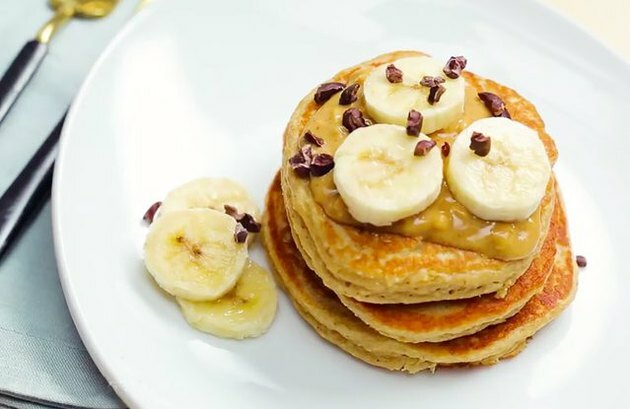 Now check out these peanut butter-based breakfast recipes that will not only keep you full and satisfied all morning long, they'll also change your mind about enjoying peanut butter at breakfast. Peanut butter has, at times, gotten a bad rap thanks to words associated with it like trans fat and saturated fat. While peanuts have heart-healthy fats, just because they also contain saturated fat doesn't automatically make them dangerous to consume, according to Walter C. Willett, M.D. Professor of Nutrition, Harvard School of Public Health. Willett reports, "Olive oil, wheat germ, and even tofu — all "healthy" foods — have some saturated fat. It's the whole package of nutrients, not just one or two, that determines how good a particular food is for health." And as for trans fat, Linda V. Van Horn, RN and professor at Northwestern University told CNN, "Just remember to check the label for 0 trans fats and preferably 0 added sugars." She added that you can avoid trans fats and sugars altogether by grinding your own. If you still aren't convinced but are craving that peanut taste, try cooking with PB2, a powdered peanut butter that cuts the fat (and the calories) by 85 percent. 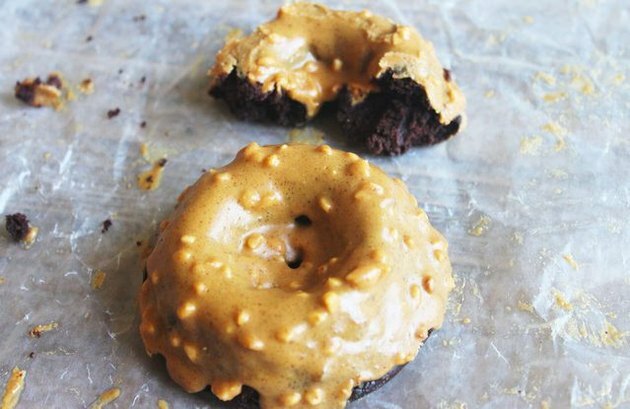 Fiber-and-protein-rich doughnuts? Yes please! These are a sweet way to start your day, but they are also filled with lots of good-for-you ingredients that will help offset any potential sugar crash. In addition to being made with two cups of fiber-filled black beans, there's also fiber in those tan-colored legumes. A diet rich in fiber is essential for a healthy gut and can help reduce the risk of heart disease, inflammation of the large intestine as well as reduce the risk of Type 2 diabetes. Protein is essential for building muscles in your body but a breakfast high in protein will also keep you feeling fuller, longer. These doughnuts get a triple play of protein in the form of a Whey Protein Isolate powder, five eggs and of course the peanuts which, according to the USDA, have almost 38 grams of protein in one cup. When all is said and done, one of these doughnuts contains 12 grams of protein per serving. Not bad for a doughnut! 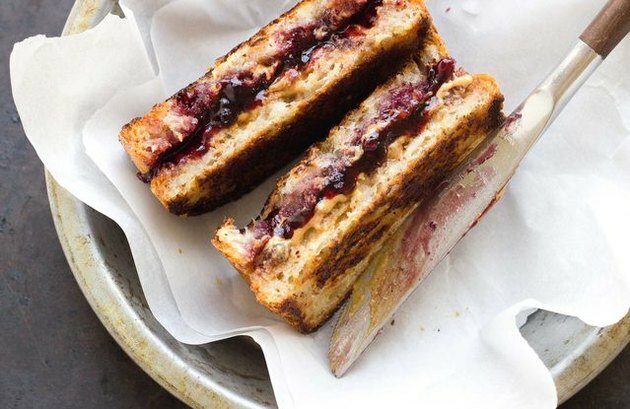 Whoever said peanut butter and jelly sandwiches had to be eaten at just lunch? This version takes the good ole standby to the next level by grilling it, turning it into the perfect morning comfort food during the colder months. And comfort food doesn't always mean bad for you, either. With this sandwich, choose unrefined coconut oil (better for your overall wellness) to toast the bread. Choose whole grains to promote a healthy gut but most importantly, when it comes to peanut butter, and it's sidekick jelly (or jam), watch your portions to keep this meal from wrecking your daily nutritional needs. A typical serving of peanut butter is usually two tablespoons and this recipe calls for just one. 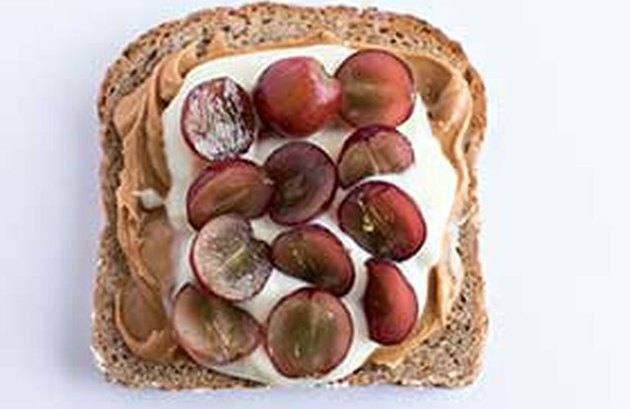 Greek yogurt is always a good idea thanks to its multitude of benefits (high in protein, low in sodium and carbohydrates), but add it to some whole grain bread, slathered in peanut butter topped with grapes, and you've got yourself a nutritionally-charged morning meal that will also leave you satisfied. 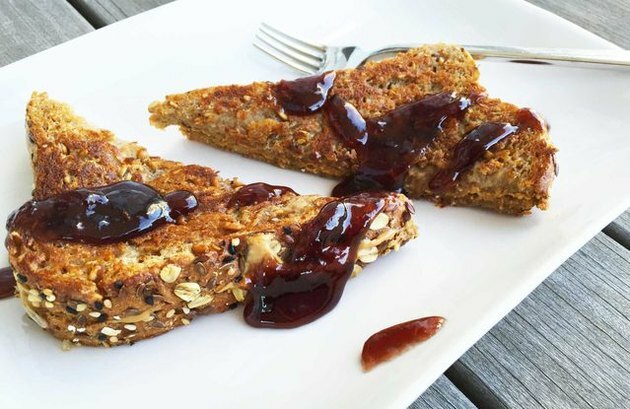 You can quickly make this meal gluten free by using bread like BFree, a brand that makes bread products free of common allergens like wheat, dairy, egg, nuts, and soy. If you aren't gluten-free, The Nutritious Life Studio CEO and co-founder Keri Glassman, MS, RD, CDN reported she likes Ezekiel bread because it has zero sugar and is made with whole grains or legumes, which ups the protein. In addition to containing essential vitamins like vitamin E, magnesium, potassium and vitamin B6, the Journal of American Medical Association (JAMA) published studies linking regular nut or peanut consumption with lowering the risk of developing heart disease as well as reducing the risk of Type 2 diabetes in women. This peanut butter French toast breakfast may sound indulgent, but through smarter ingredient choices, there are ways to make it a healthy go-to any day of the week. Choose sprouted bread or, at the very least, whole grain bread because they are lower in fat and higher in fiber, which is good for your gut and lowers your risk for diseases according to the Harvard T.H. Chan School of Public Health. Also opt for natural peanut butter and fruit spreads to eliminate any added sugars. Sick of avocado toast yet? 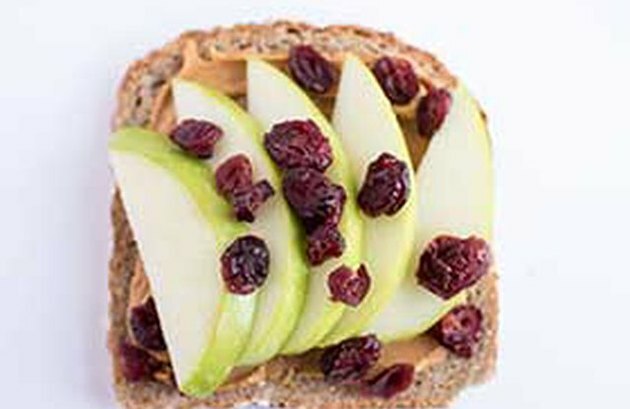 Try this breakfast made with whole grain toast, apple slices and peanut butter, topped with antioxidant-rich cranberries to wake up those taste buds. According to Samantha Cassetty, MS, RD, nutrition and weight loss expert, "Cranberries are rich in antioxidants that may help lower inflammation (and therefore protect against certain diseases), reduce the risk of certain bacterial infections and support a healthy gut." The mild flavor of peanut butter coupled with the sweet, crisp taste of apples and tartness of cranberries makes this one deeply satisfying breakfast. 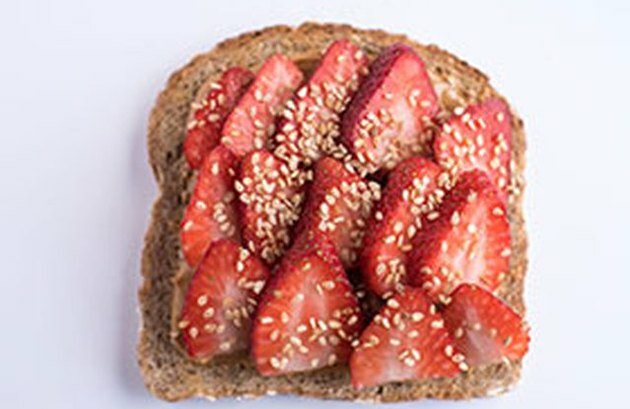 Here's another whole-grain peanut butter toast recipe to add to your weekly rotation but this one features naturally-sweet strawberries and nutritionally beneficial sesame seeds. In addition to all the good stuff we know peanuts provide, sesame seeds add a triple whammy of goodness thanks to being a great source of fiber (critical to support healthy digestive function), vitamins and minerals (that help prevent disease and support overall health) and plant-based protein. The flexibility of morning oatmeal can't be beat. 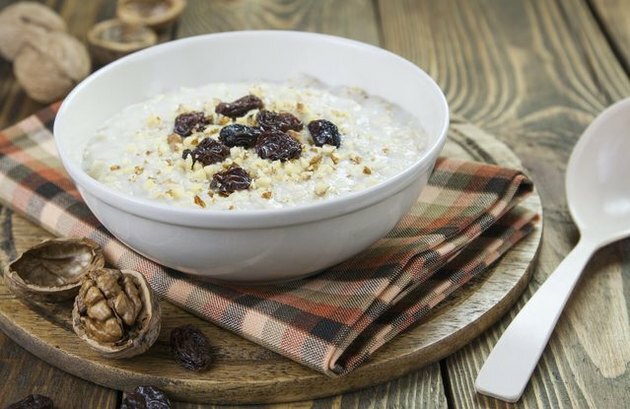 Choose gluten-free oats like this recipe calls for or the steel oat variety to make sure you are well on your way to hit your daily dietary fiber goals. And if you want to increase your protein? Add eggs whites and peanut butter for a breakfast that will deliver up to 15 grams of protein in just one bowl. If you are curious about how much protein you should be getting per day, Dr. Mike Roussell, who holds a doctorate in nutrition from Pennsylvania State University, writes that about 30 percent of your daily calories should come from protein. He says, "At that level, you won't have to worry about deficiencies, and you'll know you're getting enough of the nutrient to lose fat while also improving your heart health. Have some protein at each of your meals and snacks, and you'll hit the target with ease."